LEGISLATION on the re-employment of older workers up to the age of 67 will be introduced by 2017, said Minister of Manpower Tan Chuan-Jin, as reported by Channel News Asia. He also highlighted that it would get harder for businesses to find the required manpower from 2020, when the local labour force participation rate starts to plateau due to demographic factors. The local labour force participation rate has increased, thanks to more older workers and women back at work. However, this may have negated efforts to increase productivity, the minister said. He also said that the possiblity of having different Minimum Sums for different groups, depending on their needs, is one of the ideas being looked at for the Central Provident Fund (CPF) system. The Minimum Sum is the amount a CPF member has to set aside upon reaching 55 years to ensure some regular income upon retirement at 65. The figure, which currently stands at S$155,000, will be raised to S$161,000 in July 2015. On the transition time of 2-3 years before the new retirement age becomes law, Mr Tan said that this was to allow for markets and businesses to adjust. Talks are underway with the unions and employers to get them ready. Incentives will be given to support companies that voluntarily re-employ their older workers up to the age of 67, although Mr Tan did not elaborate. 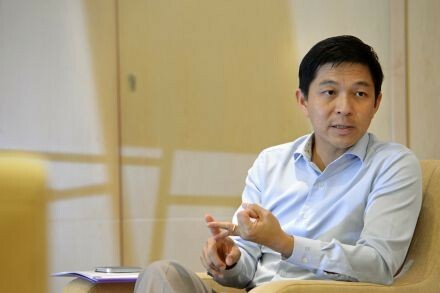 On the labour front, he said that it had been a relatively good year for Singapore, with positive business sentiments and an employment rate close to 80 per cent. The tight labour market and efforts to improve wages have also meant pay increases for those in the bottom 20th percentile. However, he noted that "ironically, while it's a positive sign having a better labour force participation, high employment numbers overall may actually negate some of that push towards that drive to productivity". The pool of local workers will start to shrink in time. "The baby boomer generation are going to begin to retire," he said. "Even with the extension of the retirement age and the Re-employment Act kicking in and so on, you will begin to see more of them leaving the workforce. Correspondingly, because of lower birth rates, the workforce entering the job market is also beginning to decline. "So what you will see in the next few years is these numbers declining. So even with Labour Force Participation measures still being in place, still being positive, that pool of labour force coming back will actually begin to reduce. So in the Population White Paper, we actually talk about how when you hit 2020 onwards, you will begin to see the labour force plateauing." Hence, the critical need to embrace productivity measures such as automation, re-engineering processes and re-skilling the workforce. "The time to change is now," said Mr Tan. On the idea of having different Minimum Sums for different groups, Mr Tan noted that even under the current system, "if you are able to accept a smaller payout, you do a property pledge and so on, you re-use the amount that you keep, then obviously the amount being streamed out is less". "So I think we are looking at various options available and then tied to these options would be differing amounts that you would need to accumulate. "We are also looking at the possibility of extending the amount, because there are also a number of people who want to top up their CPF but could not because there are limits. Actually, many also do realise that keeping monies in the CPF makes a fair degree of sense for them as well, both in terms of the savings and the interest that's being provided." Another possibility being studied is a stream of payouts that get higher as the years go by to combat the effects of inflation. The CPF Advisory Panel is expected to submit its preliminary recommendations to the government by February 2015.